With his soulful voice and earthy, Southern charm, Michael Grimm charmed millions of viewers as a contestant on Season Five of NBC’s popular America’s Got Talent. Parlaying his substantial singer-songwriter appeal into a first-place finish, Michael took home the one-million-dollar prize and headlined the first-ever national “America’s Got Talent Tour.” Following that, he toured with the legendary Stevie Nicks and Heart, playing to arenas of 20,000. In the spring of 2011, Michael debuted his first major label release, the self-titled Michael Grimm. Working with Grammy-award winning producer Don Was (The Rolling Stones, Elton John, B.B.King), Michael released an album that had his fans purchasing it in droves. “Oh, it’s swampy,” he said. “It’s Michael Grimm leaving his hat on. This is me. It’s the way I’ve always been since I was a teenager, wearing hats and singing the music that I love to sing.” The album featured some legendary talent, including Ann Wilson (Heart), Ian McLagan (Faces, Bob Dylan, Bruce Springsteen, John Mayer), Davey Faragher (Elvis Costello, Cracker) and Greg Leisz (Avenged Sevenfold, The Eagles). Thirty plus Grammy-nominated albums, Kenny Aronoff played drums, with the legendary Waddy Wachtel on guitar. The album joined several previous self-releases by Michael, all available on MichaelGrimmMusic.com, at CDBaby.com, and on iTunes. Michael grew up listening to the country artists his grandmother favored, classics like Ernest Tubb, Hank Williams, George Jones, and Ray Price. When he was 11, a club owner who had heard about him singing at a wedding said, “I know you’re going on 12, but if you bring a legal guardian and you want to sing a karaoke set here … we can’t pay you anything, but you can put a tip jar down.” Michael accepted and performed there for the next several years. At age 15, he began writing songs and teaching himself how to play guitar. “I knew just being a singer wouldn’t put bread on the table,” he said. “You’ve got to have something else going. I needed to be a musician. So my entire 16th year, while everyone else was playing and getting on, I was locked up in my bedroom learning to play my guitar.” A few years later, he was hired as a guitarist and back-up vocalist for the live celebrity impersonation show “Legends in Concert” in Biloxi. In his late teens, Michael was discovered by Ann McNair, step-mother of the late NFL star Steve McNair and a singer with both Gospel and Nashville roots. She took him to Nashville, where he signed with an indie label and released the single, “John Wayne and Jesus.” That song won him the Christian Country Music Association’s first-ever “Star of Tomorrow” Award. One night, a woman named Cookie Watkins, who played Tina Turner, came to Biloxi to do her act. “I was amazed at her voice,” Michael said. “I fell in love with soul because of Aretha Franklin, but Cookie Watkins is the real reason I sing the way I do. That’s when I switched from country to diving into all these R&B greats, like Otis Redding, Sam Cooke, Al Green, and Etta James, as well as the blue-eyed soul guys, like the Righteous Brothers, Joe Cocker, Michael McDonald, and Daryl Hall.” At age 21, his talent starting to turn heads everywhere he went, Michael took a job performing at Las Vegas “Legends in Concert” and made the move west, where he's lived for the past decade and worked with some of music’s biggest producers and stars. Then, in 2005, his life was changed forever when Hurricane Katrina decimated his hometown of Waveland. “The whole town was flattened by the tidal surge. My grandparents had to move into a FEMA trailer... [then] into another mobile home in the woods. All I wanted to do was find a way to help.” Enter America’s Got Talent. In the spring of 2010, Michael auditioned for the show, which debuted in June. His tremendous talent and genuine emotion over his grandparents' loss resonated with 4 million viewers, who voted him the winner in the most talented year ever, after his roof-raising rendition of “When A Man Loves A Woman.” Immediately, despite his humble and self-taught roots, a fedora-wearing super-star was born. Following his win and the release of his debut major label CD, Michael turned to the business of live shows, giving back to his fans what they had given to him. Throughout 2011 and into 2012, he played venues across America, from California to New York. Among many others, he headlined the Jimmy Rodgers Festival in Meridian, Mississippi, and became the first-ever resident headliner at the popular Ovation Showroom at Green Valley Ranch Resort in Las Vegas. 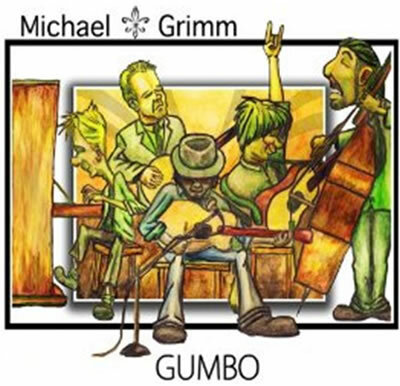 In June 2012, Michael released a fun, summer CD entitled Gumbo, on which he will be touring for the remainder of the year. He’s also in development on a big production show called Michael Grimm – Fairy Tales, which will debut in late 2012 or early 2013 at a venue still to be selected. Copyright © 2013 Entertainers Resource Directory All rights reserved.